Measurement is central to agile development and is a natural outcome of the iterative and empirical methods that make up agile practices. But in any case we need ways to measure the progress of technology development projects. Often we establish measures expecting that the information will better inform our decisions, or retrospectively establish what when wrong. However, despite our best intentions, we often fall short and end up measuring the wrong things, or worse, we find ourselves dealing with the unintended consequences of misinterpreting the results of poor measurement. Measurement is a natural activity. Measurement in sports is common, helping to evaluate the relative strength of teams or players in hopes of predicting an outcome. In manufacturing we use measurement to evaluate variation from specification or adherence to process. We evaluate network capacity in IT to help plan for network expansion. In business, we might use metrics to help evaluate the effectiveness of a marketing campaign or whether or not to acquire a company. In most cases, measurement provides us insight and a sense of control. Developing software is obscure work by its nature, so it is difficult to measure progress. Yet we treat it like an assembly line, with management directing the movement of value from the minds of engineers to the customer. Software development might seem like manufacturing widgets or building houses, but in truth it is quite different. This creative process is inventive, rather than constructive, and measurement brings clarity and insight. Compounding the complexity is the poorly defined requirements and shifting technology that typically accompany technology projects. To manage this work, empirical methods are usually more effective than directed methods. Implemented well, these methods provide greater capability when adapting to changing conditions. Though to be effective, empirical methods require sound evidence for decision-making, so they rely heavily on good measurement. Measure to gain understanding of the development process, and to make informed and data-driven decisions when adapting to changing requirements, technology, and market conditions. We intend to measure the ‘right things’ but often we end up measuring the ‘easy things’. Of course, the issue is if the ‘easy things’ are not the ‘right things’, poor decisions will follow due to their basis on ineffective or misleading data. Not often used today, lines-of-code (LOC) provides a good example of something trivial to measure but with ambiguous meaning. At first glance LOC seems to make sense. We pay programmers to write code so the more lines-of-code they write the more productive they are, right? Well, not exactly. LOC is a measure of magnitude and we have not established that more = better. This becomes apparent if we shift our thinking to outcomes. For example, few would argue that a given piece of software was ready to ship to a customer because engineering had written some arbitrary number of lines of code, much in the same way a book should not be considered ready for publication because the author had written a certain number of pages. Perhaps shippable product was not what we intended by this measurement after all. Maybe we were interested in evaluating how busy the engineers were. Unfortunately, the metric fails here too. In practice good programmers may improve code by reducing line-count as they refactor code that has become inefficient through organic growth. In this case, it would be a mistake to conclude a team was not productive if the line-count failed to increase. Developing metrics with focus on outcomes helps avoid such pitfalls by clearly establishing the intent and expected interpretation of the measurement. Examples of outcome-focused measurement might include the value delivered to a customer and the flow of work through a team. To measure value delivered, teams develop estimates for each increment of work. As work is completed, teams aggregate the estimates to demonstrate to the business the value delivered by that team. To measure flow, teams might measure the amount of time between the creation of a requirement and the delivery of that requirement to a production system. Using this information, teams can identify opportunities for improvement. Metrics focused on outcomes require more thought but they yield better understanding while at the same time avoid the drawbacks of poor measurement. Measure with focus on outcomes and understand the intention of the measurement. These measures may be harder to develop, but they will provide a better context for making decisions. It is challenging to develop good metrics so take an iterative and incremental approach, letting the metrics evolve over time. Demonstrate ideas early and solicit feedback, do not wait until a measure or chart is ‘ready’ for the organization. The response received will be valuable and transparency helps foster a sense of trust, which is important in establishing legitimacy. In addition, transparency will help engage the organization by establishing, as a natural activity, measurement and the data-driven decision-making that follows it. Measures including bug counts and cycle-time help us gain insight into product quality and process efficiency. However there are other dimensions that we would like to evaluate but they may come with some difficulty. An example is predictability, or the ability to forecast when a given piece of functionality might be ready for the market. In principle it is simple. Evaluate how much work there is and the capacity of a team to do that work and then perform a simple calculation. The challenge is that both scope of work and team capacity will likely rely on estimation. Estimation is an essential skill and teams must gain proficiency to address the inherent ambiguity that is associated with forecasting in technology projects. It can be challenging, or even intimidating, but with practice teams can quickly demonstrate consistent estimates. 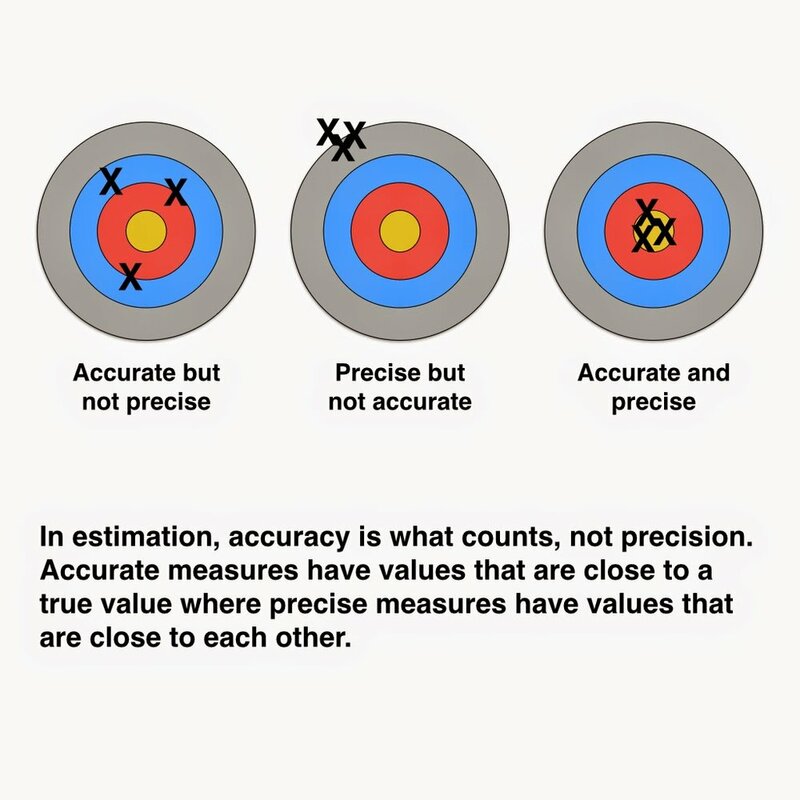 Contributing to the discomfort in estimating is a tendency to pursue precision, rather than accuracy. Accuracy is the goal, as changing conditions in technology projects make developing precise estimates a pointless exercise. Further, the time and energy used to develop a precise estimate is usually better spent on developing the product, leaving the variance to average out over time. Let’s look at mowing the lawn to demonstrate this point. Drawing on previous experience with grass length, moisture, and the weather forecast, we might conclude it will take about two hours to mow the lawn. Previous mows have taken between 110 and 135 minutes to complete, so this is an accurate estimate with a reasonable amount of risk due to variance. Alternatively, we could develop a precise estimate. We could sample grass length, measure moisture conditions, and review weather forecasts. Taking these data, we could evaluate them for several test strips of lawn to determine a rate. Using this rate and a precise measure of the whole lawn, we can calculate the precise estimate. Assume the result of the calculation is 128.63 minutes; are we better off with the precision? We must consider what value precision brings as the cost may be significant. More often than not, accurate estimates will suffice and it is best to just get to work. Measure transparently and evolve metrics to meet the needs of the organization by engaging stakeholders early for feedback. For metrics based on estimation, focus on accuracy, not precision, and let teams improve their estimation ability through experimentation. Measurement and incentive can have unintended consequence, as is demonstrated in Scott Adams’ classic Dilbert cartoon from 1995. The manager’s intent is clear but he fails to understand that writing quality software is difficult and writing terrible software is very, very easy. The desired behavior is that the engineers will spend their time identifying and fixing bugs that already exist in the software. Instead, the engineers respond to the incentives by writing new and low-quality software, and reap the rewards that come from it. The structure of this measure and the incentives that follow will only perpetuate the creation of low-quality software. In fact, this scenario is more destructive than it first appears. If we were to evaluate team performance by measuring bug discovery rate, LOC, and payouts to employees for bugs found, what would we expect to see? These indicators would likely increase with more bugs being discovered and fixed, and we would conclude the quality of the software is increasing. However the new and low-quality software has the focus of engineering and the existing bugs will receive little attention. The net result is the overall quality of the software is likely to go down. This example assumes an ineffective development culture. Though in high-performing environments, be careful to establish metrics that do not work against good cultural norms, e.g., pride in software quality. Acknowledge the impact of measurement on teams and individuals and evaluate this impact to establish incentives that encourage desired behaviors. If accused of success, what would be the evidence? Measurement is a natural activity in agile development, so work to establish it as a part of the culture. Leverage metrics to help all stakeholders evaluate the best courses of action through transparent and qualified data. With good data, the organization can improve predictability, efficiency, quality, and even employee happiness. Measure with focus on outcomes and understand the intention of the measurement. These measures can be harder to develop, but they will provide a better context for making decisions. For depth on estimation and planning, see Agile Estimating and Planning, by Mike Cohn. See The Ball Point Game for a tool to help teams learn to estimate.